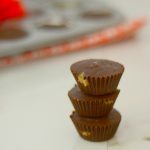 Cashew butter cups are just like your favorite peanut butter cup treats but they are Paleo, vegan and refined sugar free. You really can’t go wrong. Prepare a mini muffin tin with mini cupcake liners. Melt about 1/2 cup chocolate chips and 1 tsp of coconut oil together. If you do this in the microwave, stir about every 30 seconds. If you use a double boiler, keep your eye on it. Pour a think layer of chocolate in the bottom of each cupcake liner. Tilt the pan gently to ensure that chocolate goes up the sides of the cupcake liner a bit. Mix together the cashew butter, maple syrup and salt and stir until it is a little bit thicker than the honey. Put the cashew caramel mixture into a ZipLoc bag and snip off the end. Squeeze a dollop (about a teaspoon) into each cupcake liner. Gently tap the cupcake pan against the counter to level out the filling. Melt the rest of the chocolate and coconut oil and pour on top of each candy. Sprinkle with a bit of sea salt, if you have it. Store in the refrigerator until solid. Enjoy straight out of the refrigerator.